Luke McCambley, 23, of New York, races to a first-place finish at the Westport Road Runners Series 4.7-miler on Saturday. McCambley finished the course at Longshore Country Club in 25:41 for his fourth straight win. The results have been quite rewarding of late for some of the area's top runners in the Westport Road Runners race series. 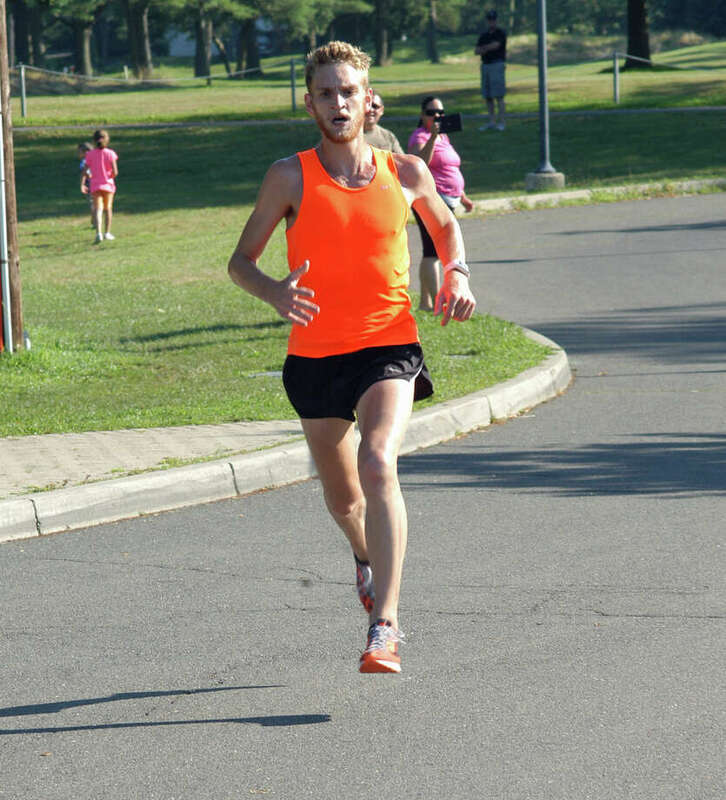 For the fourth straight week, Luke McCambley earned first place in the series, winning the 4.7-miler on Saturday at Longshore. McCambley, a 23-year-old Westport native who lives in New York City, finished Saturday's run in a time of 25 minutes and 41 seconds. Spencer Brown, 16, from Wilton, was the runner-up for the third straight week in 26:07. For McCambley, his familiarity with the area -- and the course in particular -- helped him determine a proper pace for the race. "You just know what to expect, you know where you are. It's easier to feel the finish when you know where the finish is," McCambley said. McCambley ran the race with his brother, Jake, and sister Elysse. Jake didn't hang around the finish line. He continued to run another ten or so miles as he trains for a marathon. The top female finisher was New Canaan's Caroline Murray, 20, who completed the run in 11th place with a time of 30:13. Murray, a soccer player at Ohio State University, also has experience in running the course and said that familarity paid off toward the finish. She knew, upon reaching the entrance to the country club, that there was still nearly a mile of running ahead of her before approaching the finish. Ridgefield's James Osborn, 34, was third in 26:17; Bethel's Piotr Kostyk, 23, was fourth in 28:53; Darien's Justin Lubeley, 36, was fifth in 28:55; Westport's David Allen, 43, was sixth in 29:29; Eric Sydor, 34, of Westport, was seventh in 29:44; and Patrick Sullivan, 51, of Westport, was eighth in 29:53. Rounding out the top 10 were Jamie Horowitz, 37, of Weston, in 30:00 and Keith White, 35, of Westport, in 30:06. All of the runners were treated to a 72-degree morning. "It's fantastic. It was beautiful -- nice breeze, sun. It's as good as it gets," said Westport's Peter Huggins, 44, who finished 20th in 32:23. "I used to do this all the time and the weather was good so I came out to do it again." The series continues each Saturday at 8 a.m., culminating with a 10-miler at Staples High School on Aug. 31. "Laddie runs great races," Huggins said, referring to Laddie Lawrence, the longtime race director. Westport's David Menoni pushed his three children, Hunter, Emerson, and Cash, in a stroller. "They always cross the line before I do," Menoni said lightheartedly. The father said he makes use of the time on the course by helping his toddlers learn. They discuss shapes and numbers, for example, while chewing up mileage. "They have fun," Menoni added. The race continues on Saturday with a 5.85-mile race at Compo Beach. It begins at 8 a.m.
1. Luke McCambley, Westport, 23, 25:41; 2. Spencer Brown, Wilton, 15, 26:07; 3. James Osborn, Ridgefield, 34, 26:17; 4. Piotr Kostyk, Bethel, 23, 28:53; 5. Justin Lubeley, Darien, 36, 28:55; 6. David Allen, Westport, 43, 29:29; 7. Eric Sydor, Westport, 34, 29:44; 8. Patrick Sullivan, Westport, 51, 29:53; 9. Jamie Horowitz, Weston, 37, 30:00; 10. Keith White, Westport, 35, 30:06; 11. Caroline Murray, New Canaan, 20, 30:13; 12. Daniel Landy, Westport, 15, 30:36; 13. David Ott, Darien, 50, 31:01; 14. Josh Lander, Westport, 40, 31:05; 15. Cate Allen, Fairfield, 16, 31:48; 16. Grace Loh, Darien, 17, 31:48; 17. Staci Huelat, Norwalk, 25, 31:52; 18. Marc Landy, Westport, 52, 32:10; 19. Will Hoffman, Wilton, 16, 32:15; 20. Peter Huggins, Westport, 44, 32:23; 21. Matthew Spiegel, Westport, 53, 32:25; 22. Robert Gallace, Southport, 50, 32:30; 23. Ray Vogt, Fairfield, 50, 32:37; 24. Chip Murray, New Canaan, 23, 32:48; 25. Joe Von Ehr, Southport, 60, 33:04.